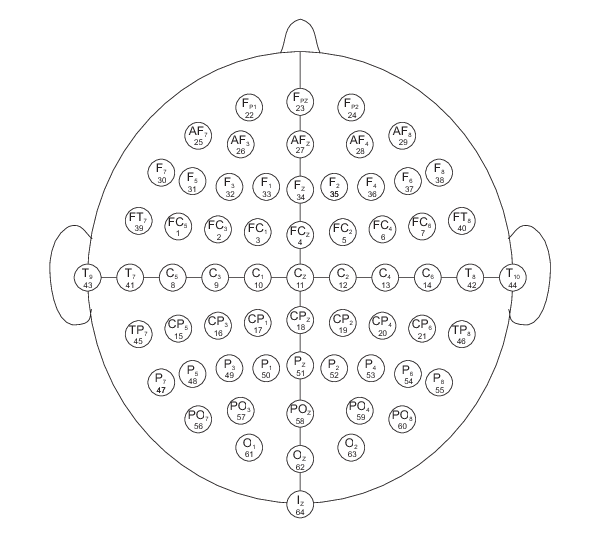 This data set consists of over 1500 one- and two-minute EEG recordings, obtained from 109 volunteers, as described below. A target appears on either the left or the right side of the screen. The subject opens and closes the corresponding fist until the target disappears. Then the subject relaxes. A target appears on either the left or the right side of the screen. The subject imagines opening and closing the corresponding fist until the target disappears. Then the subject relaxes. A target appears on either the top or the bottom of the screen. The subject opens and closes either both fists (if the target is on top) or both feet (if the target is on the bottom) until the target disappears. Then the subject relaxes. A target appears on either the top or the bottom of the screen. The subject imagines opening and closing either both fists (if the target is on top) or both feet (if the target is on the bottom) until the target disappears. Then the subject relaxes. The data are provided here in EDF+ format (containing 64 EEG signals, each sampled at 160 samples per second, and an annotation channel). For use with PhysioToolkit software, rdedfann generated a separate PhysioBank-compatible annotation file (with the suffix .event) for each recording. The .event files and the annotation channels in the corresponding .edf files contain identical data. In the BCI2000-format versions of these files, which may be available from the contributors of this data set, these annotations are encoded as values of 0, 1, or 2 in the TargetCode state variable. 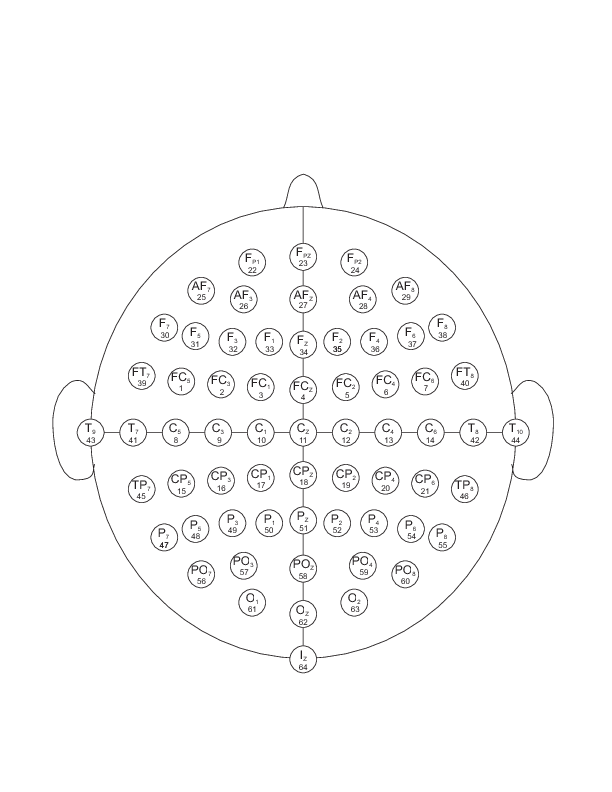 The EEGs were recorded from 64 electrodes as per the international 10-10 system (excluding electrodes Nz, F9, F10, FT9, FT10, A1, A2, TP9, TP10, P9, and P10), as shown below (and in this PDF figure). The numbers below each electrode name indicate the order in which they appear in the records; note that signals in the records are numbered from 0 to 63, while the numbers in the figure range from 1 to 64. This data set was created and contributed to PhysioBank by Gerwin Schalk (schalk at wadsworth dot org) and his colleagues at the BCI R&D Program, Wadsworth Center, New York State Department of Health, Albany, NY. W.A. Sarnacki collected the data. Aditya Joshi compiled the dataset and prepared the documentation. D.J. McFarland and J.R. Wolpaw were responsible for experimental design and project oversight, respectively. This work was supported by grants from NIH/NIBIB ((EB006356 (GS) and EB00856 (JRW and GS)).